The 73 bus at the end of our road runs to Oxford Street and there are still some presents to be bought, so we head on down. What possesses anyone to shopping there at Christmas? We take a break at a quiet cafe down James Street as darkness falls. Season's greetings! I'll be posting images on Instagram and Twitter over the break, do drop in and follow me if that's your thing. 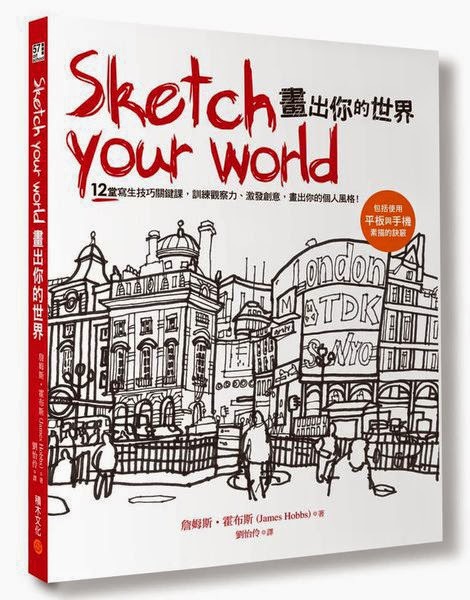 It was a busy weekend this week, first at Waterstones Piccadilly's first art book fair, where it was great to meet publishers, writers, artists and book lovers in Europe's biggest bookshop, and sign copies of Sketch Your World. 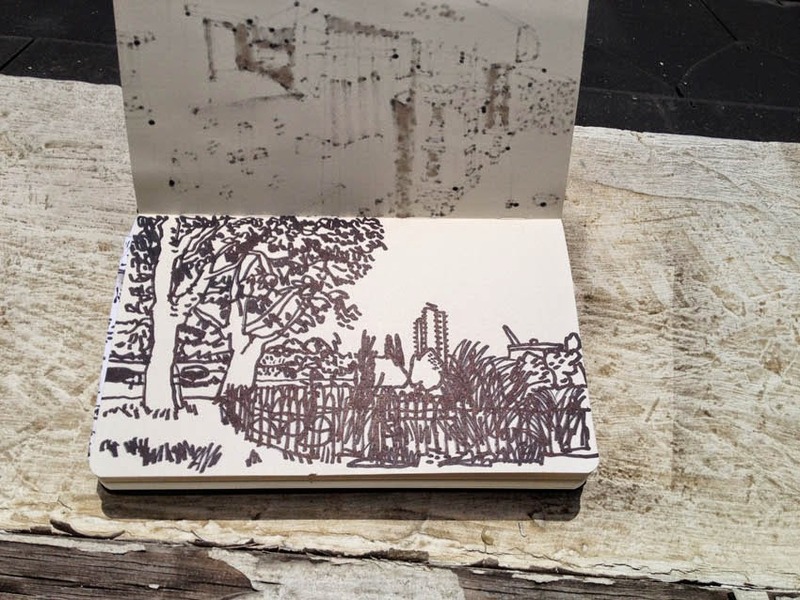 I sat with Owen Gildersleeve, the author of Paper Cut – he cut paper rather more meticulously than I drew the scene through the crowds to the Tate Publishing desk opposite. 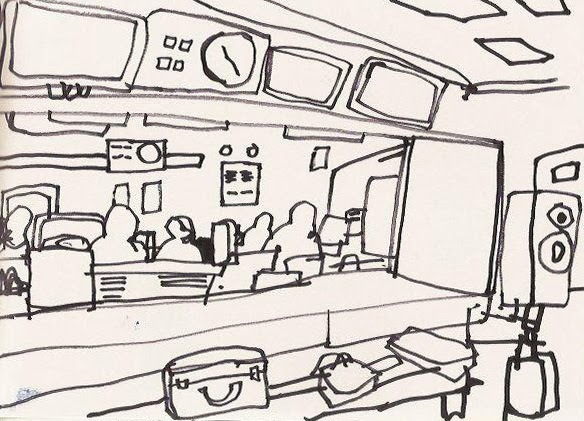 The following day London's Urban Sketchers joined the Dining Room Drawing Club at Trinity Buoy Wharf at Draw Britain Now organised by the Campaign for Drawing. 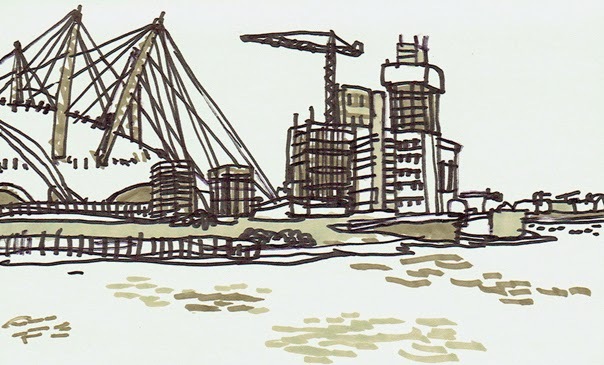 The wharf is post industrial, right across the river from the O2 arena, the home of London's only lighthouse, and hosting work by 23 artists shortlisted for the 2014 John Ruskin Prize (the exhibition continues until 30 November). 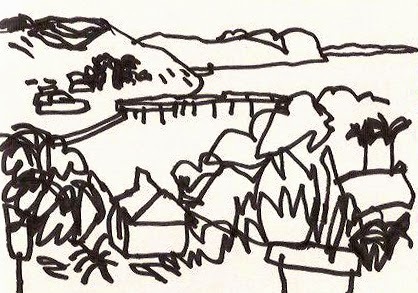 The rain came, and it started getting dark in mid afternoon, but there was still a lot of drawing going on when we met to compare work at the end of the day. (The Fatboy Diner got a lot of sheltering custom that afternoon.) The wharf is a great place to visit – I'm going back. 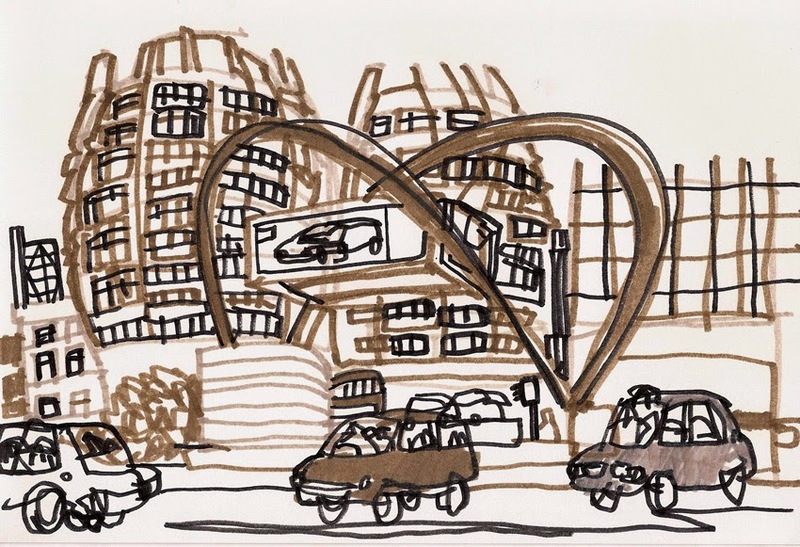 The fair runs from 1pm to 5pm, is free, and a great chance to meet artists and authors, get involved in drawing workshops and see what great art books are out now. Come along and say hello. I'm taking some sketchbooks. Bring some of your own to show me! There's more information at the Waterstones website. 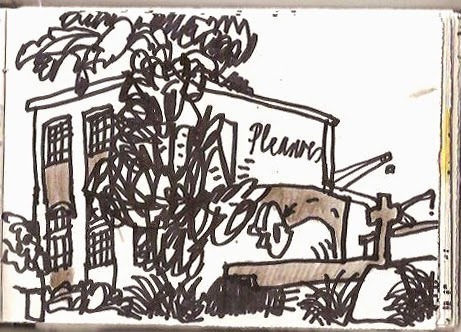 The following day, Sunday 16 November, there is a London Urban Sketchers sketchcrawl at Trinity Buoy Wharf, in the East End. There's more information about that at the London USk website. I hope to see you there, also. 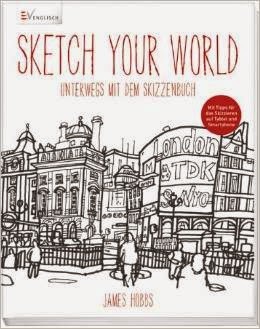 I'm happy to say that Sketch Your World is now available in a German edition: Sketch Your World: Unterwegs mit dem Skizzenbuch, published by Englisch Verlag. It's on sale at the usual German online places and in bookshops. Wondering what it's about? 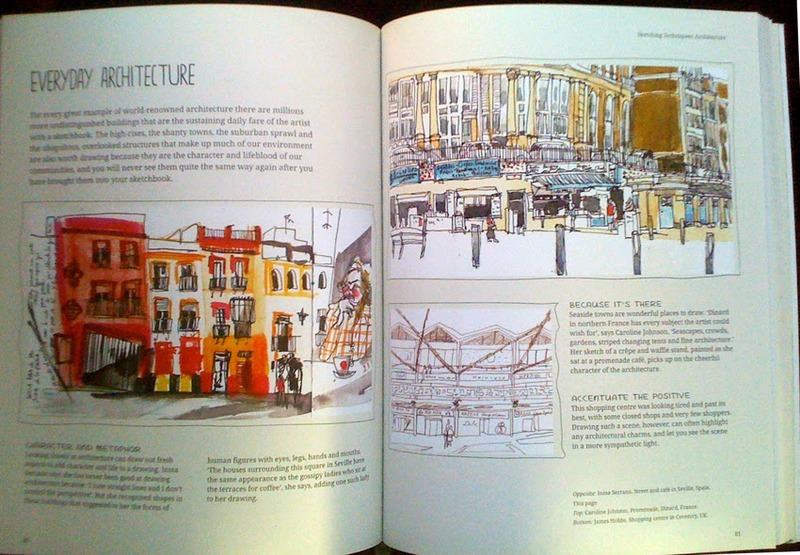 It features the drawings of 60 artists who work in sketchbooks, and is available in UK, US, Asian and French editions, as well as German. 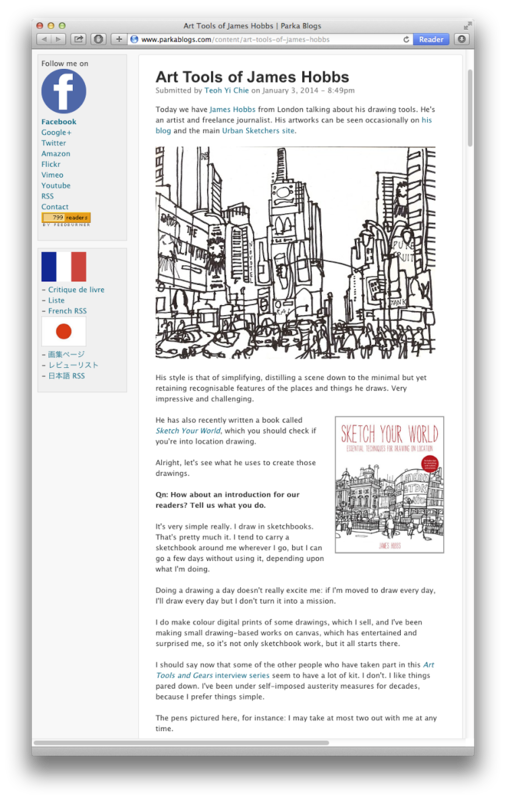 You can find out more about Sketch Your World at www.facebook.com/sketchyourworld. 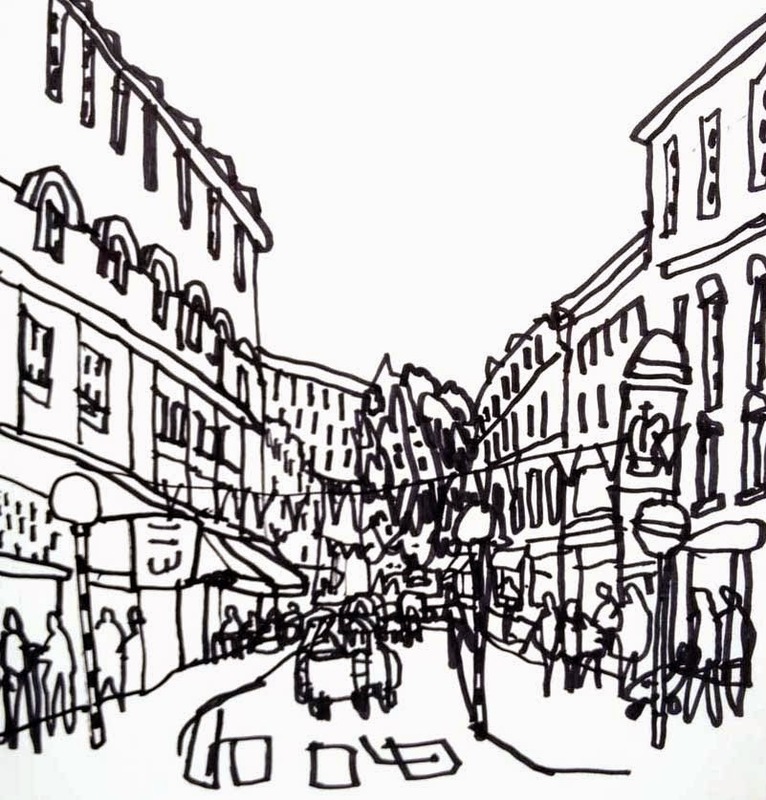 Seven Dials, a throbbing junction on the north side of Covent Garden, soon gets crowded with pedestrians, especially when the curtain is about to rise on Matilda the Musical at the Cambridge Theatre, which is at its heart. 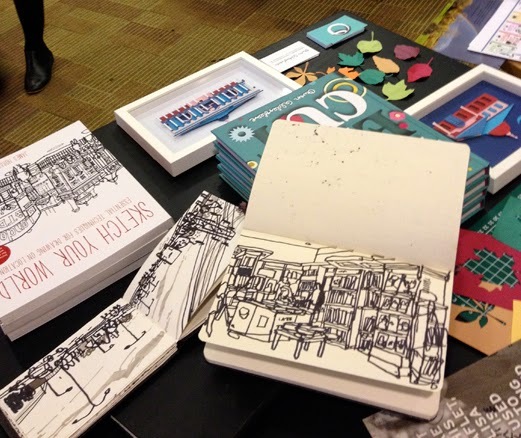 On Saturday it was busier still with people taking part in Moleskine City Stories, a drawing event organised by Moleskine in collaboration with Urban Sketchers at Moleskine's King Street store and the London Graphic Centre in nearby Shelton Street. 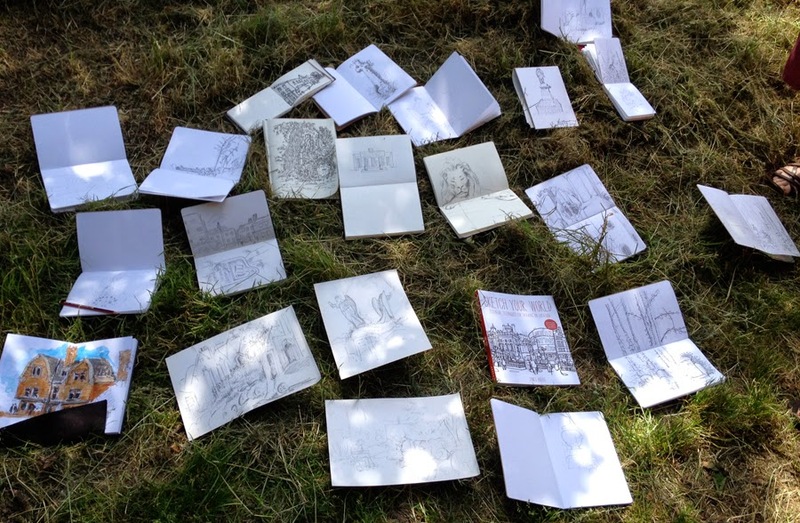 I was there representing Urban Sketchers with Andrea Joseph, Olha Pryymak and Adebanji Alade; we drew and led learning sessions through the day, and contributed to a growing gallery of drawings in each venue. It was a learning experience – for me, I mean. 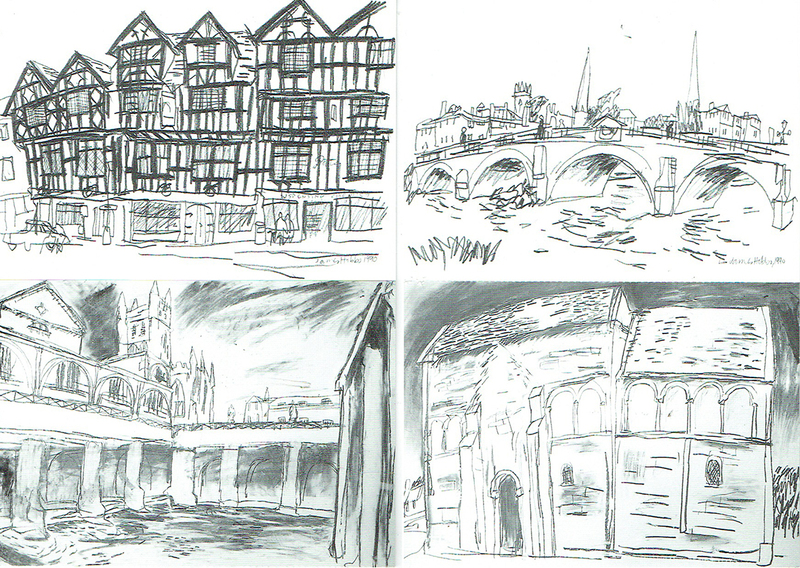 There was the usual fantastic range of people taking part, from children to elderly, and from totally inexperienced to professionals, and the usual amazing range of approaches to observational drawing. And to talk was to share ideas and connect in a way that you don't if you draw in isolation. 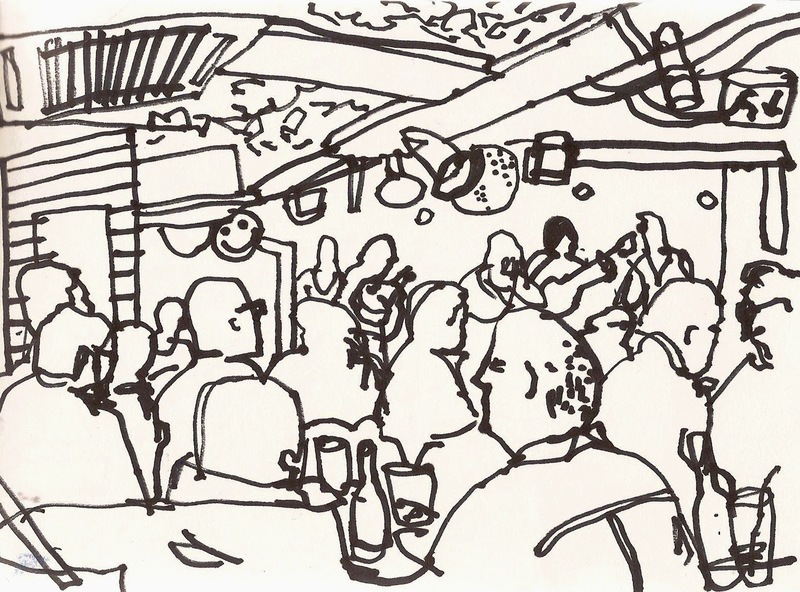 Thanks to everyone who came, and those who donated their drawings to the cause of the non-profit Lettera27, and its mission to support the right to literacy, education and the access to knowledge. We're back from a holiday on the scenic banks of the Ardeche river, which carves its way through central southern France. There are gorges of impressive limestone cliffs, wooded sections and water that is deliciously cooling to swim in when the temperatures get into the 30Cs or more. Watching kayakers heading downstream, and sometimes taking an involuntary dip, is evidently a popular pastime for those lazing on the pebbled beaches. 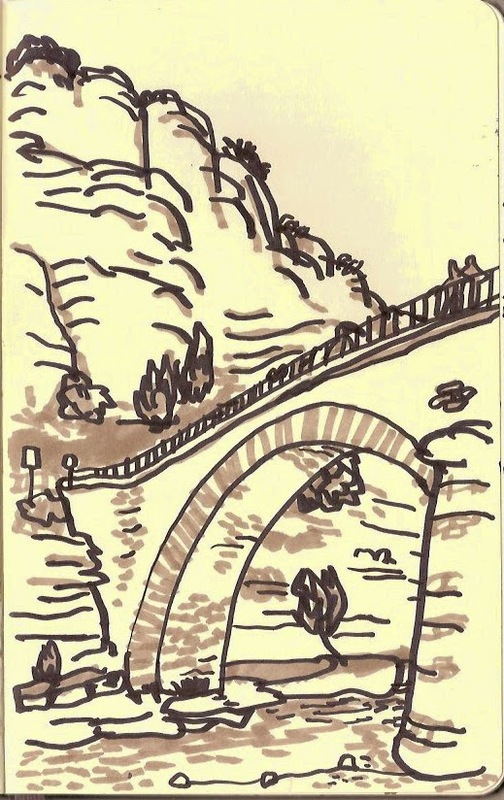 Part of the joy of visiting this region is to search out quiet bathing spots among the trees that seem to be popular with the locals – although the drawings here of Labeaume and Balazuc, while still quiet when compared with coastal resorts, are of scenes firmly on the tourist trail. 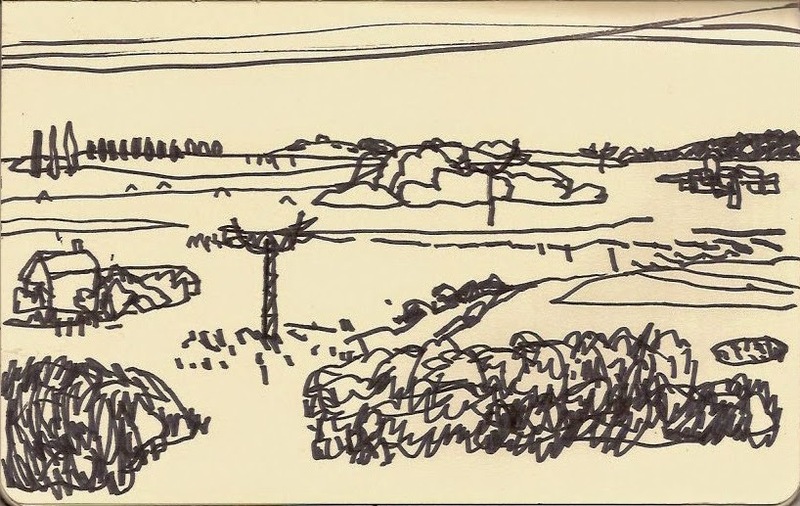 Our six-hour journey home by train from Avignon gave plenty of opportunity for drawing fleeting scenes from the window. 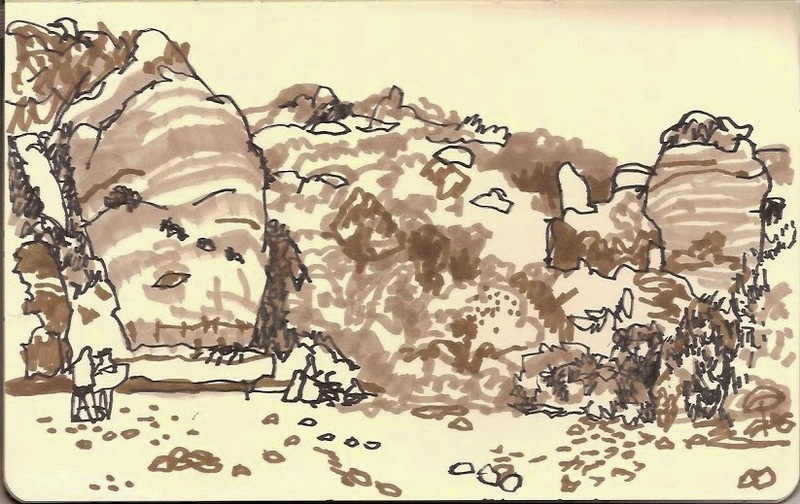 After spending days drawing geological formations shaped over centuries, it was invigorating to try to capture the landscape as it passed at 200mph. 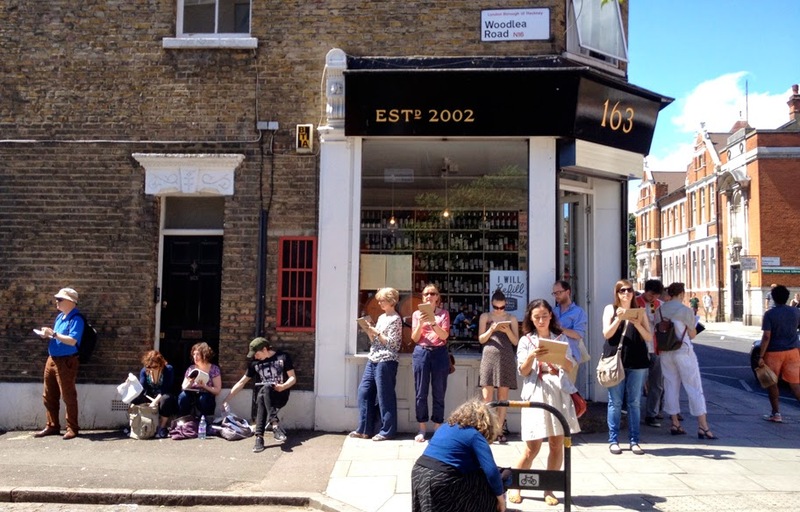 Assorted sketchbook users from London and further afield landed on Portobello Road market on 12 July. 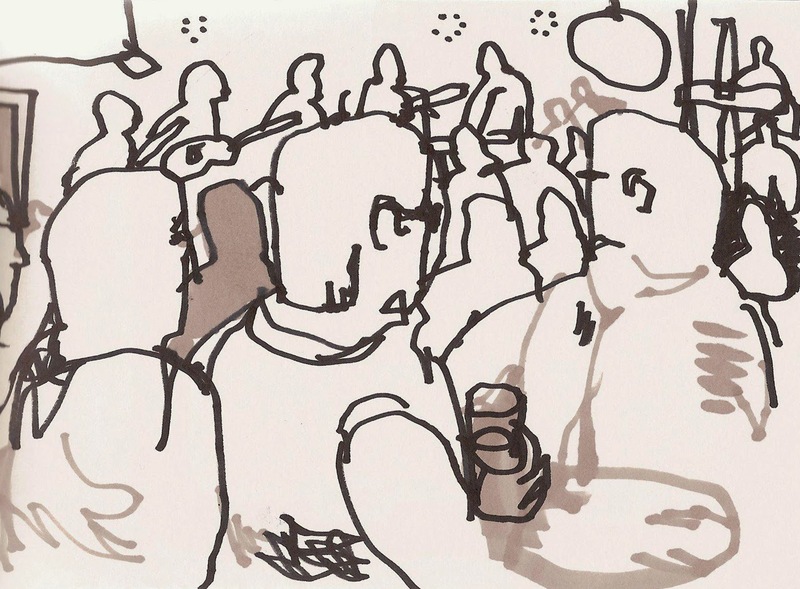 When sketchcrawls take place in such crowded venues it can be difficult to know just how many people are taking part, but even with the massed ranks of antique buyers, fruit and veg consumers and Notting Hill location spotters, it was somehow never difficult to spot someone drawing. Isabel Carmona, Swasky and Miguel Herranz were in town straight from their Oxford USk workshop, and it was great also to meet Inma Serrano, whose work I particularly love. 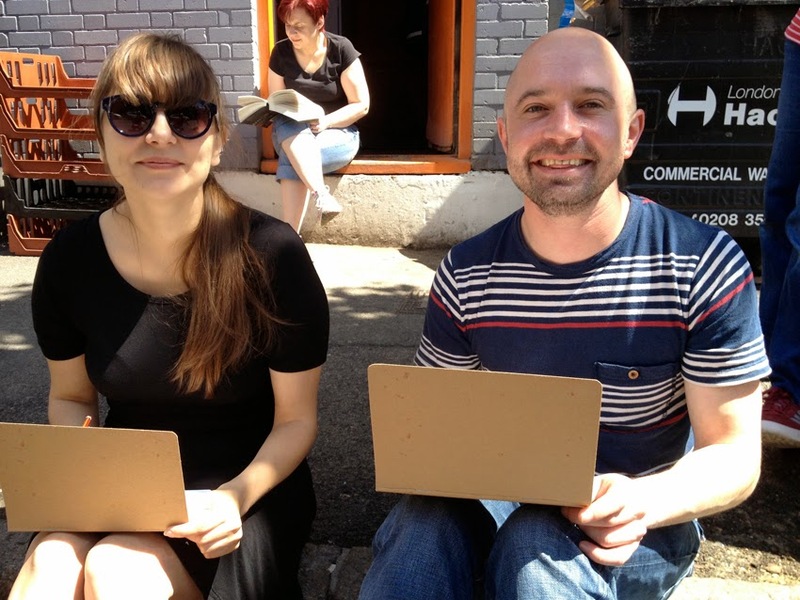 (Inma and Miguel, visiting from Spain, both have drawings in Sketch Your World.) It was a scorching day, and some had fallen by the wayside by the time we took shelter in the Castle pub later in the afternoon to restore fluids and meet old and new friends. 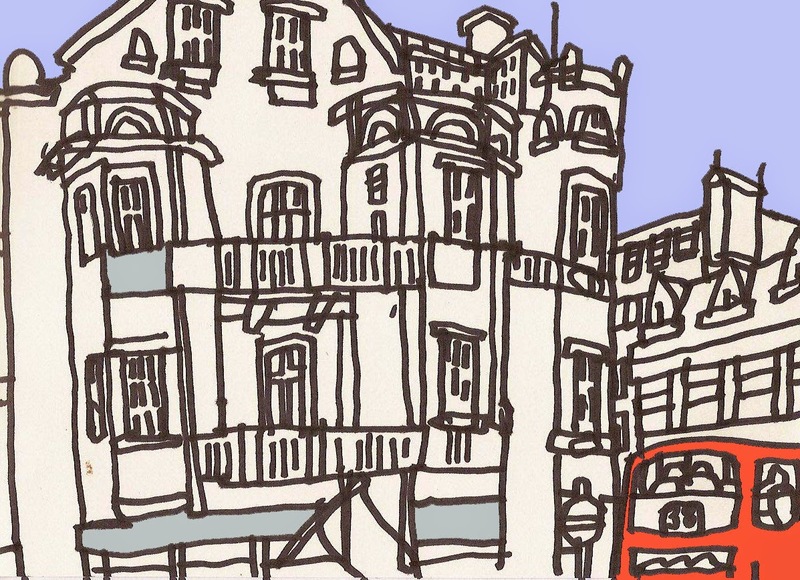 There's a sketchcrawl along Portobello Road, London W11, this weekend on Saturday 12 July, attended by Urban Sketchers from this week's Oxford Urban Sketchers workshop. The weather forecast isn't looking too bad, so come if you can. The plan is to meet at around 11am at Charlie's Portobello Road cafe, which is at number 58, and finish at around 4pm at the Castle pub. There's more information here, and a plan of the route here. Bring your drawing materials and join us. 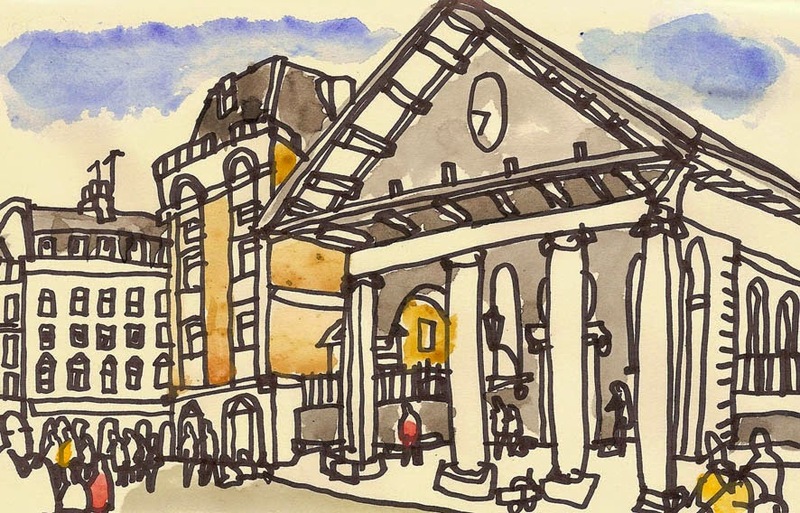 There is a London Urban Sketchers sketchcrawl on Saturday 24 May 2014, meeting at 11am at Timberyard cafe, Old Street, where there is currently a show of drawings by five of the London group (including me, actually). The idea is to then head east towards Shoreditch to finish around 3.30pm at the Shoreditch High Street overground station. Want to come? Need more information? 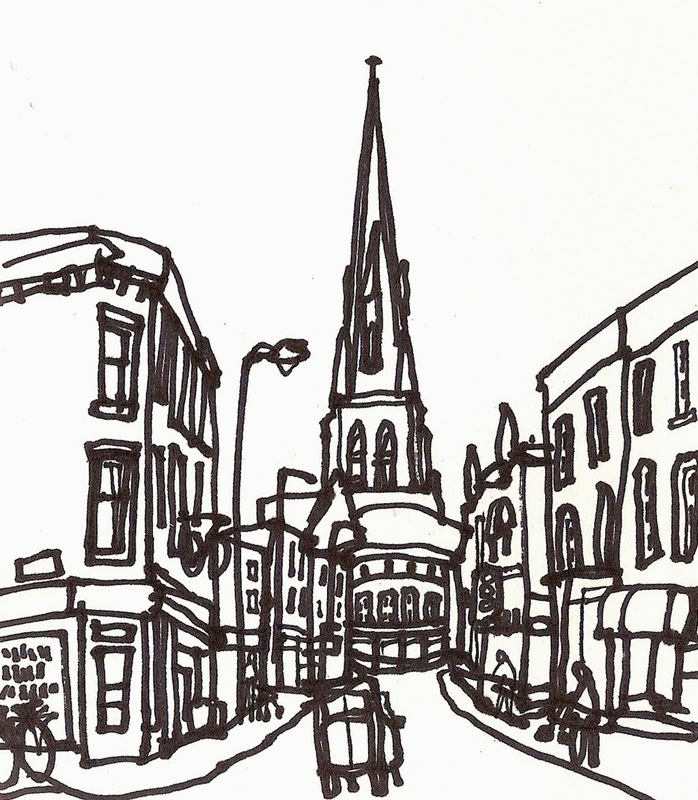 There's more at the London Urban Sketchers website. 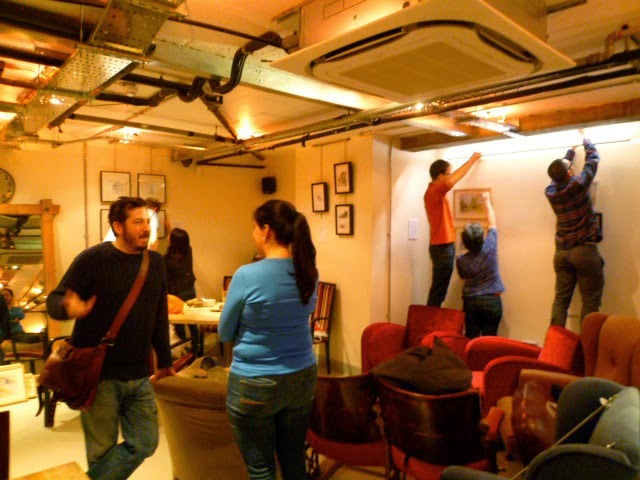 It's free, relaxed and everyone is welcome — just bring something to draw on and with. And stay as long as you want. 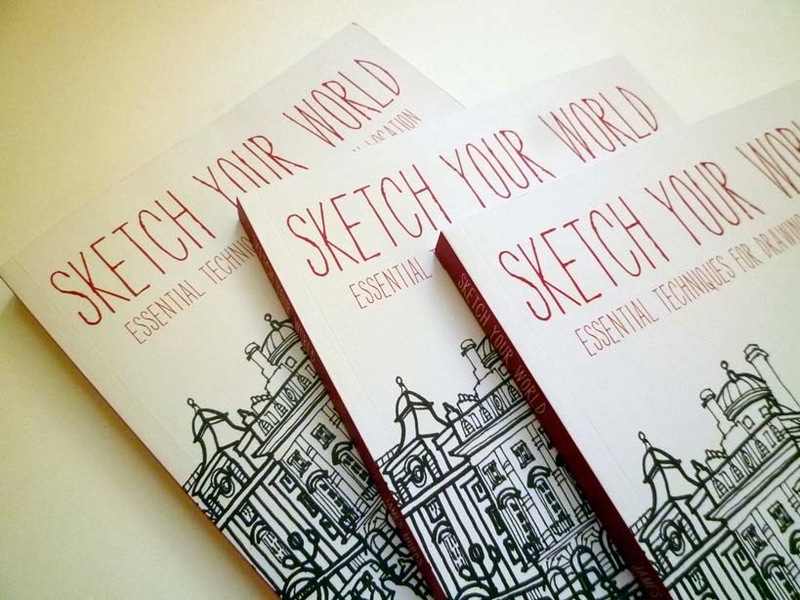 I'll be signing copies of Sketch Your World and bringing along a selection of my sketchbooks to a drop-in session at Cass Art, Islington, on Saturday 17 May from 2pm to 4pm. Cass Art kindly lent me art materials for product shots in the book. It's free. 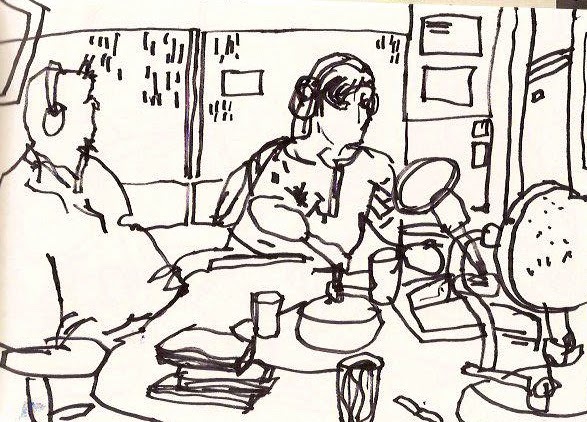 Come and talk drawing. 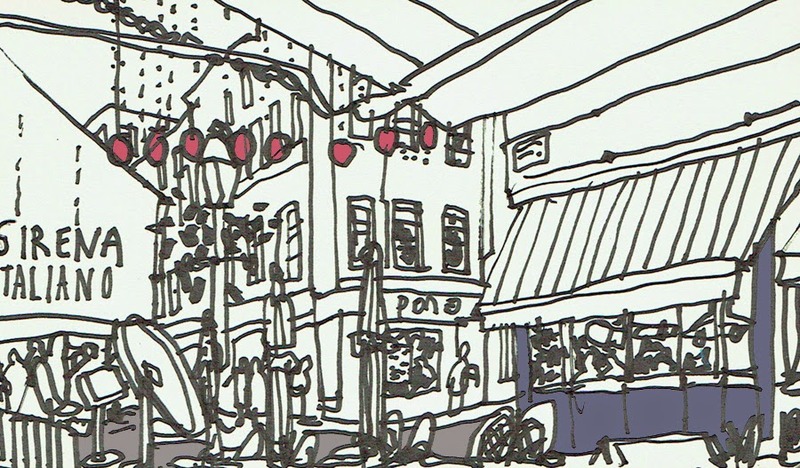 Bring some sketchbooks. There's more info here. 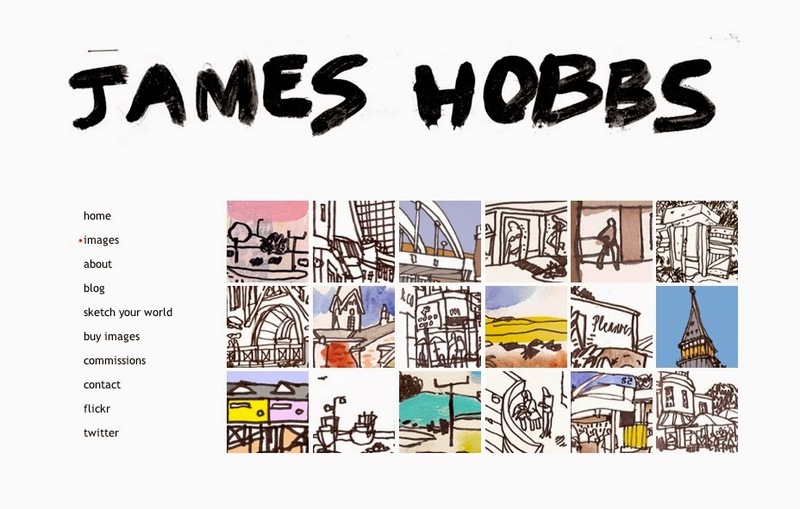 My website www.james-hobbs.co.uk has been spruced up and updated, with more links, new images and a design that echoes this blog. My thanks to Colin Bowling for this.